Home Costs > How Much Does Laminating Cost? Lamination is the process when two or more layers combine together to create a “protective” shield. People generally laminate items such as important paper, calendars, ID badges and more. If you want to get something laminated at a retailer, such as Office Depot or FedEx Office, they are going to charge anywhere from $1 to $3 for a simple 8-by-10-inches to as much as $2 to $3 per square feet for a larger project. The cost will depend on the retailer you choose, the thickness of the paper, the size of the project and the finish you want. 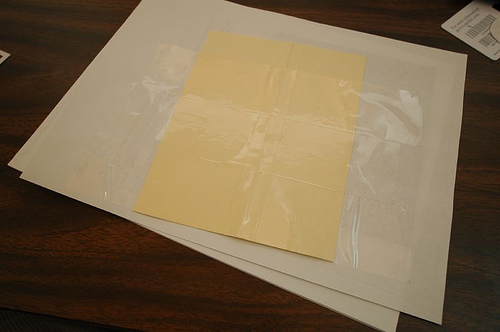 An 8×10 photo, for example, will cost anywhere from $6 to $10 to laminate professionally. A 24×24 piece of paper, on the other hand, can cost anywhere from $12 to $24. For a bigger project, such as something that measures 48×60, can cost $55 to $90. According to one forum member on atozteacherstuff.com, she paid $0.25 per foot at a local teacher supply store. Those who want to purchase a laminator for home use will pay anywhere from $25 to as much as $500 for a professional machine. The Scotch Laminator, for example, will cost between $30 and $90. The Fellowes Saturn SL 125, which is built for both the home and office, will cost anywhere from $160 to $200. The Fellowes Venus 125 can cost anywhere from $195 to $300. Each laminate job can have its own type of finish. These finishes will include a luster, glossy, matte or thermal. Each quality will vary in pricing. Luster is going to be on the lower end while a thermal finish will be on the higher end. Each job will have its own thickness, which can be either 1.2, 1.5, 1.7, 3, 5, 7 or 10 mil. Thicker sheets are recommended for something that may hung from a wall, while thinner sheets may be ideal for passes, badges and business cards. Edge options may include flush cut, varied margin, edge sealed, round corners and square corners. For smaller items, most retailers will allow you to do it on your own; however, anything larger may require the staff to perform the job for you. Common items laminated may include menus, posters, charts, name tags, maps, books, signs, wipe-off surfaces, rolodex cards and business cards. Some lamination machines purchased for your own use may come included with a starter kit, which can include some paper to get you started. If you want to purchase the machine for your own personal use, roll film or pouches are going to be required in order to use the machine. This paper will start at $10. A matte or gloss finish can double or triple the costs mentioned above. Some services may be able to offer premium services such as heat folding (0.25 each~), hole drilling ($0.05 each~), binding ($3 per book~), eyeletting ($0.75 each~) and easel attaching ($0.75 each~). Larger jobs may have a setup fee with some companies. This can be about $10 to $20. Consider purchasing a laminator used. By doing this, it can knock 30-50% off the cost. Only consider purchasing used if you’re going to do a lot of laminating. If not, you may want to just head to a local office supply store to have the job done for you. For those who work in an education environment, many schools have laminating machines the faculty can use. Talk with your school to see if there are machines available that you can use at no cost. Students should also talk with their college as many libraries have laminating machines available for a low cost. Look for specials and promotions at local copy centers. For example, one year, Office Max gave out free lamination jobs to test their service out. There are also many coupons available you can use as well. Keep in mind that the print centers at most office supply stores are the biggest money maker. With office supply stores, consider signing up for the store card that offers discounts. These cards are usually free to sign up for and can offer many discounts. Check with a teacher supply store near you. Some stores may charge as little as $0.25 to $0.50 per foot. In laminating in bulk, discounts may be available.